After a final Irish breakfast transfer to Shannon for your flight home. OR Travel to Dublin via Galway City, with its narrow streets, old stone and wooden shop fronts, good restaurants and busy pubs. The city has attracted a bohemian crowd of musicians and artists, which add so much to the character of the city. Enjoy some free time in the city for some personal sightseeing or shopping. Continue to Dublin, arriving at approx. 16.00 – transfer to Dublin Airport for departure flight home. 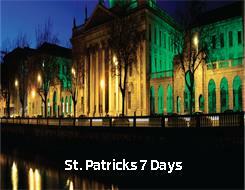 Alternatively we can book hotel accommodation for you in Dublin.